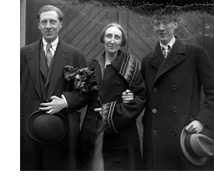 Sir Francis Osbert Sacheverell Sitwell (1892-1969), fifth baronet, came from a talented family: Cevasco estimates that he and his two siblings, Edith Sitwell and Sacheverell Sitwell (in this photograph Osbert is on the left and Sacheverell on the right) “produced almost 200 volumes of poetry, fiction, biography, music, art, and literary criticism, giving expression to their own kind of modernism, an amalgam of cubism, futurism, and dadaism best described as ‘Sitwellism’.” Osbert himself wrote a certain amount of science fiction and fantasy, as the Encyclopedia of Science Fiction notes. “Triple Fugue” (a novella published in a collection of the same name, 1924) imagines a future 1948 world which has Trotsky as Russian President and greatly extended lifespans for the rich. The Man Who Lost Himself (1929) is the fictional biography of a man who died in the second half of the twentieth century. Miracle on Sinai (1933) tells how God deposits new Tablets of the Law on Mount Sinai, causing much debate and, eventually, a war. There are other items which relate: a ghost story—A Place of One’s Own (1941) and a collection of satirical fairy-tales, Fee Fi Fo Fum! : A Book of Fairy Stories (1959). Osbert Sitwell was born in London, the son of the fourth baronet Sir George Reresby Sitwell and of Lady Ida Emily Augusta Denison (d. 1937), daughter of the first earl of Londesborough. His childhood was spent either at Renishaw Hall in Derbyshire, or in Scarborough, another family home. He went to Eton between 1906 and 1909, and wanted to go to Oxford; his father insisted he should take a commission in the Sherwood Rangers, a cavalry regiment. He would joke that he preferred giraffes to horses, and after falling off a few times transferred to the Grenadier Guards. When not on duty in the Tower of London, he was active in the literary and cultural life of London. In November 1914, his regiment was mobilized, and he spent the next four years in the War. Even before the war was over, the Sitwell brothers were recognised as proponents of modernism. Immediately after the war they organised an exhibition of modern painters: Matisse, Utrillo, Picasso, and Modigliani. In the years that followed he published poetry (including his war poetry), short stories and travel writing; his first novel was Before the Bombardment (1926), which received some acclaim. Later works were not particularly successful. In 1943, having succeeded to the baronetcy, be began what was to become a five-volume autobiography. The first volume was called Left Hand, Right Hand (1945), as Cevasco explains: “from the belief of palmists that the left hand reveals characteristics determined at birth, while the right reflects those determined by an individual’s own will”. Volume 2, The Scarlet Tree (1946), dealt with the days at Eton and his first trip to his beloved Italy; no. 3, Great Morning (1948), was about his boyhood in Derbyshire and his military career; no. 4, Laughter in the Next Room (1949) started on 11 November 1918 and continued through the 1920s and 1930s; while the last volume, Noble Essences: a Book of Characters (1950) was about art, and his literary and artistic friends. In 1962 he published a postscript, a sixth volume: Tales My Father Taught Me. He received many honours in his last years, during which he was suffering from Parkinson’s disease. He died in 1969, in the castle near Florence that his father had left him. The above relies on G.A. Cevasco’s entry in the Oxford Dictionary of National Biography.